Hatcher Selby, very interested, but just who is he anyway? Susan Brooks (formerly Susan Torrenti) is the widow of Roberto Torrenti, who was executed for a double murder which occurred during a bank robbery. The proceeds were never recovered. Susan was pregnant at the time. After a son, Calvin, was born, she had both their surnames changed to Brooks to avoid notoriety. Susan receives a letter from Roberto's father, Gino Torrenti, in Sicily, explaining he is dying and wishes to hold his grandson before he dies. Susan travels to Sicily to grant his last wish, taking Calvin along. While traveling, she meets and befriends Miss Flora Gentry, a retired teacher; and Hatcher Selby; both traveling to Sicily as well. On the train in Italy, a fellow traveler, Pietro Souza, is murdered and his bag stolen. When she arrives at the Torrenti home, things are not as she expected. She gets a cold reception from Gino, who wants to keep the baby for himself. One sister-in-law, Maria Torrenti, is likewise cold and hostile to her. The other sister-in-law, Carmelita Torrenti, is friendly. It becomes apparent Gino has been planning to keep the baby and send Susan back to the US. She tries to extricate herself from the family. She has conversations with Hatcher Selby, who seems to know everything about everybody. She finds everyone suspects her of having the robbery proceeds, and bringing them to Sicily. Flora Gentry has meanwhile has been smuggling a package for Carlo Monaco. In the search for the stolen money, and Flora's package, Carlo is found dead. 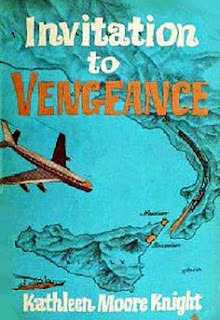 This book will cause you to cancel any travel plans to Sicily. It portrays an island where the Mafia is in control, no one trusts anyone else, or especially the police. Despite that premise, this story is a James Bond type thriller where all the bad guys are after the loot with a lot of collateral damage. The characters do stretch believeability - the protagonist Susan is too naïve to sense the danger in accepting her father-in-law's strange request, especially after arriving to find his story of approaching death to be false. Teacher Flora Gentry is a two-dimensional stereotype of a schoolteacher, and how did she ever get duped into being smuggling a secret package into Italy? The strangest part of the book is the ending, where several of the Sicilians undergo a personality transplant; suggesting that the author was struggling on how to end the novel. This is the first book by this author that I wasn't satisfied with.